The Minsk agrrement has come to a standstill. From Ukraine can't accept bogus elections in Donbass and grant autonony to puppet republics while Russia simultaneously expand its power in the region. The diplomatic efforts of the West to find a political solution to the Ukraine conflict have reached an impasse. Implementation of the terms of the Minsk Agreement – far-reaching autonomy rights for Donbas in return for a withdrawal of Russian arms and troops, the holding of regional elections under international supervision, Ukrainian control of the border with Russia – has come to a standstill. Not even the exchange of prisoners is proceeding. There are continual violations of the ceasefire. Every day brings new reports by the Ukrainian army of deaths and injuries. Russian weapons and fighters continue to flood into Donbas. 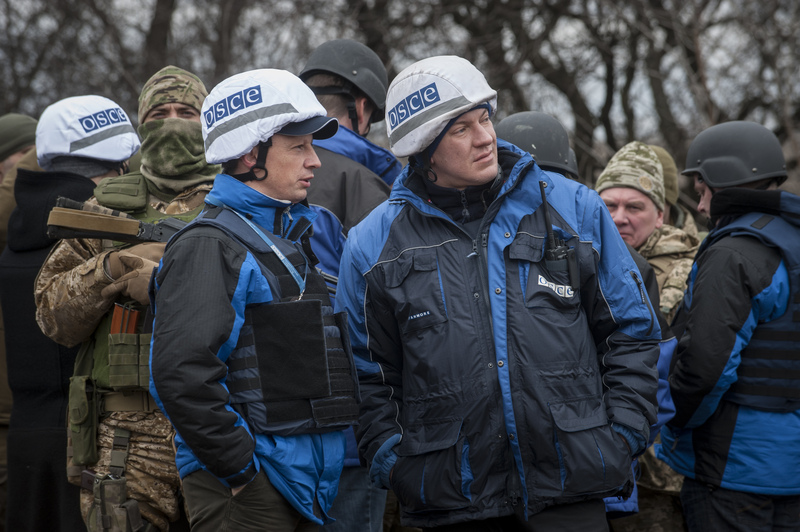 The OSCE monitoring mission is regularly impeded by the separatists. Around 1.5 million people have fled the occupied areas. Reports coming out of Donetsk and Luhansk suggest that the areas are ruled by brute force. Mercenaries line their pockets. Behind the Potemkin-like facade of the “People’s Republics”, Russian officers and advisors hold sway. Up to now the German Government and the EU have avoided plain speaking – not because they did not know what was going on, but because they wanted to leave the door open for Putin to withdraw from the affair without loss of face. The aim was to mediate, not to take sides. This indecisive position leaves room for the Russian propaganda and makes it difficult to win support for Ukraine in the European public. The Dutch referendum is a warning sign in this regard. Yet Russia‘s undeclared war against Ukraine is plain for all to see. His first act was the so-called “voluntary annexation” of Crimea, the second the war in Eastern Ukraine controlled by the Kremlin. As it did from the outset of “Operation Crimea”, the Russian leadership also played its role as a party to the war in Donbas. The most recent example in this respect was supplied by the spokeswoman for the Russian Foreign Ministry. Following demands for the release of the Ukrainian pilot, Nadiya Savchenko, who was sentenced to 22 years in prison in a show trial in Moscow, Maria Zakharova coolly declared that Russia was not part of the Minsk Agreements and that the obligations arising from these Agreements concerned only the two parties to the conflict – that is to say Kyiv and the separatist republics. Why does the West play along with this travesty, instead of confronting the Russian leadership with their responsibility? The same double dealing also characterises the OSCE mission monitoring the ceasefire. Russia constitutes the second largest contingent in the mission and exerts significant influence on operations planning and situation reports. The aggressor appears as arbitrator. At the same time the Kremlin washes its hands of any responsibility as time and again the OSCE team is denied access to military hotspots in the occupied areas. The upgrading of the OSCE mandate to a robust police mission is a proposal worth considering, but while the Kremlin acts simultaneously as aggressor and mediator, the OSCE will never play more than a fig-leaf role. While pressure mounts on Ukraine to give the occupied areas wide-ranging autonomy, Russia extends its control. A government commission for Donbas involving five ministries and the security service has been set up in Moscow, bringing together the political, financial and administrative threads. The media are firmly under Russian control and any pro-Ukrainian activity is perilous. It is inconceivable how even halfway free and fair elections should be possible under these circumstances, to say nothing of voting rights for refugees. To demand that Ukraine fulfils its obligations arising from the Minsk Agreements while the Russian side carries out the virtual annexation of Donbas is tantamount to the West giving its blessing to the establishment of a Russian puppet republic in Eastern Ukraine. Is this to be the price of “normalising” relations with Russia? The annexation of Crimea barely rates a mention any more. There is no discussion of the renewed suppression and expulsion of the Tatars. Remarkably little is said about Russia’s obligations with regard to the implementation of the Minsk Agreements. Why do we behave as though we have no reliable knowledge of Russia’s footprint in Eastern Ukraine? Why does the West not call in unison for Russia to stop supplying fresh mercenaries? While Russian citizens who “go abroad to fight” are threatened with severe penalties in the case of IS, the irregular combatants in Donbas are recruited and trained in Russia and financed by the government. It seems that Moscow does not consider that Ukraine falls into the category of “abroad”. The Minsk Agreements were imposed on President Poroshenko at a desperate time when the Ukrainian army faced collapse in the face of an offensive mounted by regular Russian troops. They were supposed to suspend the war and set in motion a political process, and that remains the order of the day. It is unreasonable, however, to demand that Ukraine fulfil its obligations without a substantive quid pro quo on Moscow’s part. There is therefore a need for a new diplomatic attempt and a new format to find a political solution to the conflict. The USA and United Kingdom must be involved in this process. They together with Russia were the guarantor powers of the 1994 Budapest Protocol in which Ukraine gave up its nuclear weapons In return for guarantees of political sovereignty and territorial integrity. Washington and London cannot evade their commitments arising from this agreement. Anything else would also send a fatal signal in terms of disarmament policy, indicating that those who give up their nuclear weapons in return for international guarantees find themselves on shifting sand. Only if the West shows a united front with respect to this question is there any likelihood that Putin will be convinced that cooperation with Europe and America is more important for Russia than the dismemberment of Ukraine. Those who signal to him that he can have both are making a big mistake. That is why the sanctions must also remain in place for as long as the Kremlin continues to pursue its interventionist policy. To give in to Russia’s power game would not only be a betrayal of the Ukrainian democracy movement, it would also be a betrayal of Europe. A European Union which takes itself seriously must insist on the principles of the European peace order, at the heart of which is the renunciation of violence and equal sovereignty for all European countries. One can negotiate with the Kremlin over many things but not about this. The EU must leave no doubt that we support the democratic renewal of Ukraine wholeheartedly and with cool reason. That is not a carte blanche for oligarchs and corrupt politicians. On the contrary, the success of the Ukrainian reform movement is under threat from without and within. It needs European solidarity, clarity and firm resolve in both directions. The german version of this article was first published at Zeit.de. One year after the annexation of Crimea, European and US experts analysed and discussed Europe’s response to Russia’s intervention in Ukraine. The conference documentation offers articles, recordings and photos. The most important change underway in Ukraine is not in economics or politics. What changed during the Euromaidan is the consciousness of the Ukrainian people. Most important now is that the international community responds speedily and clearly to what amounts to a Russian occupation of the Crimea and the additional threat of Russian troops being stationed in Ukraine. Europe is in no way powerless in the face of Russian actions, as Ralf Fücks and Walter Kaufmann illustrate in a ten-point plan.